I could carry on picking random books from the series as they could catch my eye. I could read them in the order they were written. I could read them in the author’s recommended reading order. I inclined towards the latter, but I hesitated to pick up this first book; because I feared that it would be a complicated setting a lot of things up but not so interesting for its own sake kind of book. When I found a group that was beginning to read the whole series, I knew that it was time for me to begin. I found that my fears weren’t entirely unfounded: there were a lot of characters, there were many stories opening up, and I would have been lost quite early on had my book not had a family tree I could consult; and I’m still not entirely sure about the political history or all of the implications of the story I read. That said though, I loved this book, I’m very glad that I read it. Zola’s writing about his characters and the world around them is so very vivid, and as I began to the roots and branches of this fictitious family tree I was intrigued by the possibilities it presented; for future stories and for what those stories might say. The scene is set, and then this story begins with a pair of young lovers who will be caught up in republican protests. Silvère had planned to join the ranks, and he had brought the gun that had always hung on the wall in his grandmother’s home; Miette had thought that she would be left behind, but she was caught up too and found herself carrying the flag. Then the story went back in time, recounting the recent history of Silvère’s family. Adelaide Fouque was the descended from a family of a market gardeners. She was a simple soul, and after the death of her parents during the French Revolution she was wealthy and completely alone in the world. She was courted by a farm worker named Rougon, she married him, and she gave birth to a son, Pierre. Rougon died not long after the birth of his son, and his wife fell in love with a smuggler and heavy drinker named Macquart. They had two children together: a boy named Antoine and a girl named Ursula. The three children grew up in a haphazard wild manner, and it wasn’t long before Pierre soon began to resent his illegitimate half-siblings and his weak minded mother. Fortune seemed to favour him: Antoine was conscripted into the army, Ursula married and moved away, and when Macquart was killed and Adelaide retired to his cottage to mourn he saw a wonderful opportunity . Pierre tricked his mother into signing over the family home to him, he sold it off, and he used the proceeds to set himself up in the world. He married Felicité, the daughter of a merchant, and a young woman who was every bit as socially ambitious as he was. They rose very little, but they managed to send their sons to good schools and then university, and they hoped and prayed that they would be successful and elevate their family.. It seems that the ambitions of Pierre and Felicité will always be thwarted, but finally they have a piece of luck. Their son Eugène had moved to Paris, he was mixing with important people, and he passed information to his parents that would allow them to chose the right associates, express the correct views, and rise to the very top of society in Plassans. Silvère came to Passans after the death of his mother, Ursula, and her husband, Mouret. He lived with his grandmother, Adelaide, now known to all as Aunt Dide; he was apprenticed as a wheelwright and he was introduced to Republican politics by his uncle, Antoine. Antoine had returned from the army and he was the bitterest opponent of his half brother Pierre, who he claimed had cheated him of his inheritance. When the clash of the republicans with the government came to its climax, the Rougons’ yellow drawing room had become the centre of political activity in Plassan as the great and good of the town rallied to support the status quo. Could Pierre and Felicité achive their greatest ambition? What would happen to Silvère and Miette? How would the fallout affect Aunt Dide, Antoine, the three sons of the Rougons? Those are the bare bones of the plot; a plot driven by character, by family relationships and by history. I was so impressed by the portrayal of those family relationships and of how, together with circumstance, they affect the formation of character and the making of decisions; sometimes for good but often, it seems, for bad. I was impressed by the writing. The characters lived and breathed, and everything feel utterly real. I caught the author’s cynicism; I caught his passion for his subject; and sometimes I caught his anger. One thing that particularly impressed me was the way he could take a small incident and use it to say so much. I was particularly taken with the story of the young lovers, and the writing about the natural world that ran through their story. That was something that I hadn’t found in Zola’s books before, and it balance the writing about the Rougons and the town beautifully. There were times when I thought he spent too long with one side of the story; and there were characters I saw too much and others not enough. But maybe as I read on I will see the bigger picture better. I found much to admire, I felt many emotions as I read; and, most of all, I was struck by how very well Zola laid the foundations for so many more books in this one. It’s a dilemma, isn’t it? I’m always drawn to read in publication order (it’s just the pedant in me) but I can see the logic in following an author’s recommendations. I hope you continue to enjoy Zola – one day I will read him! I think you would like Zola, so I hope you will read him one day. Reading order is a difficult one, but I don’t think any approach would be entirely wrong as the books do stand alone. I always go for the chronological order, no matter what the author says. In the main this is because I am really interested in the way in which a writer develops in respect of both style and ideas. 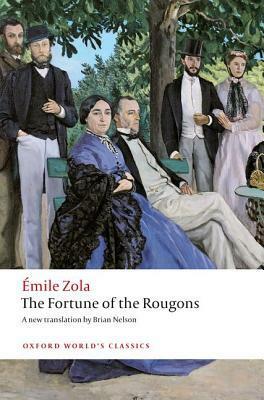 Having said that, I have to admit to never having read any Zola – an omission I should put right as soon as possible. That is an excellent argument – I also remember someone saying that we shouldn’t focus too much on chronology, because when we meet new people we don’t learn their history from start to finish, we learn it as we continue our acquaintance and learn more from them. As usual, your reading choices tempt me to follow suit. The only thing that gives me pause is your apt word ‘cynicism.’ I need the lifeline of some goodness in at least some of the characters, to keep me afloat in a story. Given my limited experience with Therese Raquin, I rather despair of finding it in these novels. However, the fine writing and the truth of the portrayals of characters are still powerful draws to try this one. There is goodness here as well as cynicism, and I think those things are to be found in all of Zola’s work in different measures. Therese Raquin is by far the darkest of the few of his books that I’ve read, so please don’t let that book put you off trying others. Hello Jane, what a great review, and I am so glad you have enjoyed it. I wonder, would you mind if we reblogged it at https://readingzola.wordpress.com/ ? Or even better, if you plan to read the entire cycle, would you like to join the bloggers there who contribute collaboratively to all things Zolaesque, posting your reviews on both blogs? Thank you! I’m happy to post or for you to re-blog, whichever works best for you. What a wonderful review! I am so glad you liked this book! I had ezactly similar apprehensions when I began reading The Fortunes and I ended up falling in love with books. The characters, the relationships and the ability to see into the very heart of the character. I thoroughly enjoyed the whole book, while the subject matter was not happy, it was in a way bittersweet! Thank you – lovely to know that we agree on another book! Gosh, that does sound complicated! How many books are there in the series, and did he write them in an order which dotted around in the historical chronology? I’m pretty bad at reading European literature, to my shame! There are twenty books, not written in order and standing alone but I suspect Zola must have had a grand plan from the beginning. It’s not quite as complicated as it sounds, because all the characters are well defined, but I couldn’t always remember how they were all related. Thank you – this is very readable so the pages turn quickly, and the books in the series do stand alone and you don’t have to commit to reading the lot.